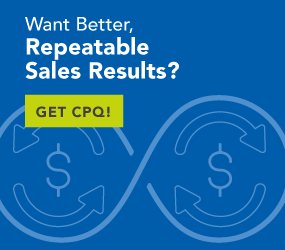 CPQ makes every dollar count in high-tech and medical-device manufacturing and selling. The other day, I had the misfortune of needing a root canal. My regular dentist referred me to a root canal specialist who, thankfully, was able to see me the following day. The next day, I was comfortably numb, laying there on the special couch/chair thing. Next to me was a large machine that looked very much like the “interrogation droid” in the original Star Wars movie. A logo and product label on the machine informed me that this was an “Acme Root Canal X-1000” or something like that. The point of my tale is that medical and other scientific pursuits are becoming more specialised, and that means the hardware and supplies supporting these activities need to be more specialised as well. While this is wonderful in terms of providing specific solutions to specific problems, it also presents challenges to those who manufacturer and sell these products. Specialty implies precision as a prerequisite for success. It also implies a smaller market, which means there are more competitive forces in play during a buy cycle. This exerts downward pressure on prices and margins. The regulatory burden, especially in the medical arena, is higher, and the need for quality is an essential element for any successful offering. CPQ can help manufacturers and Sales address these challenges. Here’s how. If you are making and selling root canal machines, mass spectrometers, gas centrifuges or specialised thermometers, you can be sure your buyer knows as much about what they need as you do. The medical-devices and healthcare-equipment market is not driven by hyperbole or extravagant promises. Features and capabilities are merely items to be checked on requirements lists. What the buyer will expect is product designers, engineers, sales and marketing people to possess the specialized knowledge that is required to understand the science behind the workings of the specific device. This will also extend into the esoteric vocabulary required to intelligently discuss the device and how it can be applied to solve a given problem. CPQ achieves this by bringing those specific knowledge workers into the design and implementation process. Product dependencies, capabilities, limits and other specifics are identified and built into the interactive buyer interviewing process. A buyer, or sales rep, conducting the requirements interview will be using vocabulary that’s familiar to the buyer. The problems addressed, the requirements specified and the choices offered during this process will be driven by product and application knowledge specific to the case at hand. Science and high-tech are not markets that accept “almost” or “close enough” values in the metrics used to quantify and define problems and solutions. Instruments and sensors must be able to demonstrate precision measurements and perform within defined ranges of acceptable error or tolerance with great consistency. The processes used to define and select solutions within these environments must demonstrate consistent application of standards and the delivery of resulting outcomes in compliance with applicable regulatory and legal requirements. With CPQ, sellers and buyers are assured that the right questions are asked and that the answers provided drive the choices offered and configurations recommended for any solution designed to address a buyer’s needs. Additionally, this process is entirely documentable to support future review of how a solution was configured and why specific choices were made. Building any specialised, complex product will likely involve comparatively high costs. This is especially true in a market that demands precision, accuracy, consistent performance and extreme quality. Additionally, competitive pressures frequently exert extreme downward pressure on prices and profit margins. This is the world of medical and high-tech devices. Manufacturers of these devices can help minimise some of these costs by utilising a basic-format product that can be modified, extended and configured to perform multiple missions. Additionally, certain parts and assemblies can be used across multiple products to reduce cost in the product, while not sacrificing quality. Product managers and engineers need to design products with this approach in mind. Additionally, the manufacturing operations managers need to extend this flexible basic product design concept into their own production processes, planning and scheduling. This approach delivers the economies associated with higher-volume production, and at the same time, facilitates the delivery of highly specialised, low-volume products common to the medical devices manufacturing segment. CPQ is uniquely qualified to facilitate this strategy. Configurations are produced by organising product and option hierarchies and coupling those with selections offered to the buyer. The available selections offered along the way are driven by a combination of buyer input and business rules. CPQ is driven by an interactive interviewing process that starts out with basic usage and environmental questions that determine what basic product is most likely to fulfil the ultimate needs of the buyer. As the question-and-answer process develops and more needs are specified, an increasing level of specialisation is manifested in the configuration produced. CPQ delivers mass customisation. Buying cycles for medical and high-tech devices can be long with frequently shifting requirements. Tight budgets within the buyer’s organization drive buyers to seek solutions in accordance with ever-changing organizational priorities. This is reinforced by the always-present knowledge that, over time, the cost of technology tends to decrease. The result is a product balancing act that frequently offsets performance with capability. Decisions may be delayed as prices trend downward for specific requirements. Funding can be reallocated toward other priorities. This should not be construed as a suggestion that fast turnaround is not important to customers. Sellers and customers are served best by quick, accurate responses. But, ultimately, choices must be made, options must be selected and funding must be committed. But the road to this decision point is littered with quotes and proposals for all manner of product combinations, capability mixes and other variables. When it’s time to arm-wrestle over the final iteration of a sales agreement, many of those previous price quotes and included features will suddenly surface with some expectation that they should be part of the agreed-upon deal. While that is not necessarily a bad thing, if those numbers are based on misunderstanding or on a reality that is no longer present, the whole deal can be endangered. CPQ prevents this type of misunderstanding from occurring. Any quotation or proposal delivered will be accompanied by a bill of materials and a proposal outlining the nature of the entire deal being placed on the table. There are no ballpark quotes in that quotes only cover specific stated product and performance options. CPQ assures the buyer and the seller that everyone understands specifically what is included with any price quoted. CPQ delivers the capability and facility to thrive in the highly competitive high-tech marketplace. Medical devices, scientific instruments and electronics offer great opportunities to manufacturers, but the market requires tight cost controls and close attention to elimination of wasteful practices or lean operation. CPQ makes the difference in medical and high-tech manufacturing and sales.